The house is a gorgeous marriage of design and technology that doesn’t compromise the build aesthetic. 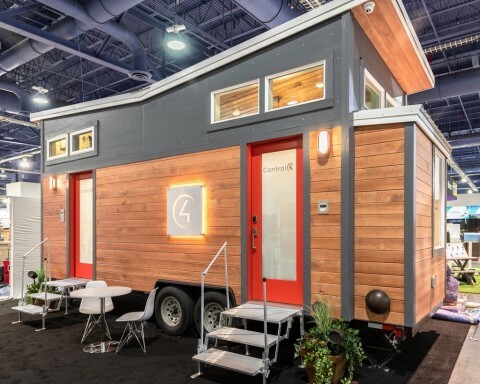 LAS VEGAS--(BUSINESS WIRE)-- International Builder Show booth SU443 – Control4�Corporation (NASDAQ: CTRL), a leading global provider of smart home solutions, announces the debut of the Control4® Tiny Smart Home, a compact, 250-square-foot smart home designed to give architects, builders, and designers an interactive, design-forward smart technology experience at Design Construction Week 2019 at IBS in Control4 booth SU443. Consumers are seeking guidance and knowledge from interior designers for smart lighting, Wi-Fi connectivity, and even intelligent appliances according to a report from the National Kitchen and Bath Association. As the prevalence of smart home technology continues to increase in home renovations and new construction projects, design professionals will need to educate themselves in order to bring their projects to life. The Control4 Tiny Smart Home is a stunning showcase introducing home automation technology and inspiring creativity among interior designers, builders, and architects. The Control4 Tiny Smart Home gives an authentic at-home feel combined with a fully-loaded smart home system, complemented by construction and beautiful design by Sprout Tiny Homes. Across the lofted bedroom, compact kitchen, and divided living space, there are dozens of entertainment and control devices to interact with using custom-engraved wall keypads, handheld remotes, touch screens, mobile devices, or voice control. The Control4 system includes many popular smart home features, such as smart lighting and shading, multi-room audio with Triad speakers, Control4 Intercom Anywhere, video distribution, temperature control, security, and more. Scenes transform the ambiance of each room in the Control4 Tiny Smart Home, as one button press, voice command, or tap adjusts lighting zones, speakers, fans, and shades simultaneously. In the kitchen say, “Alexa, turn on cooking,” to set the room to the ideal light and comfort level. At the door, press the “Away” keypad button to close the shades, shut off the interior lights, lower the thermostat, and turn on exterior lights. For the loft bedroom, where the window shades are out-of-reach, hit “Blinds Up” or “Blinds Down” to get your shading in place. Press the “Watch Movie” button to dim lights, lower shades and turn the TV on. “Outdoor” brings the entertainment and smart living experience to the patio for music that extends from the inside out. If the doorbell rings, a live audio and video feed from Intercom Anywhere will pop up on the touch screen, or the TV if it’s on, for quick video and audio communication. Control4 will be at IBS in booth SU443, and Control4’s Brad Hintze will be presenting on “The Five Levels of Smart Home” at KBIS on Tuesday, February 19, 2019 at 1:30 p.m. PT in LVCC room N228.